1. Place the potatoes into a pan, cover with water and boil for about 15 minutes until soft. During the last 8-10 minutes add the leeks. 2. Meanwhile, in a small frying pan, dry fry the black pudding until crisp. 3. In a large saucepan, dry fry the pork and leek sausages for 12-15 minutes until cooked through. 4. With an apple corer or sharp knife, remove the core of the apple, leaving the skin on. In the last 5 minutes of cooking the sausages, add the apple to the pan and cook to a light brown colour. 5. Pour in the cider or apple juice and add the thyme to the sausages; bubble until reduced slightly. 6. Drain the potatoes and leeks. Mash them with a splash of milk and a knob of butter. Stir the black pudding through the mash. 7. 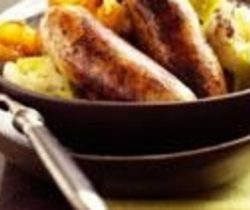 Serve the sausages with the black pudding and leek mash, apple gravy and your favourite seasonal green vegetables.